ABOUT US ship your boxes sea freight forwarding air freight forwarding vehicle transport boat shipping roll on - off shipping road and intermodal forwarding special cargo rate requests cargo tracking document center smart links references customers worldwide other moving from hungary GALERY usa purchase assistance? This is an easy process to handle your own cargo. This service is easier than you think. The hard part is, you need to make all arrangements to load the cargo. 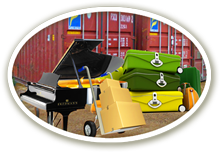 You can order all different kinds or sizes of containers anywhere in the United States. We will ship it to anywhere you like. Loading time can be arranged two ways. - Economy. "live load" means, at the time of delivery the truck driver will wait until you load the cargo. Usually two hours. In advance you can request longer than 2 hours, we can arrange it. - Drop off. Container will be staying at your location as long is you request it. Truck has to go to you twice. Drop off time can be 1 day up to 1 week; you need to plan the length of drop of time with your man power also with your available equipment helping load your cargo. Before you decide to order the container, you need to make all arrangement with your surroundings, Communities, Parks, Parking lots. ETC. You can start your plan with learn the containers dimensions. Please click below link to find our container size chart.